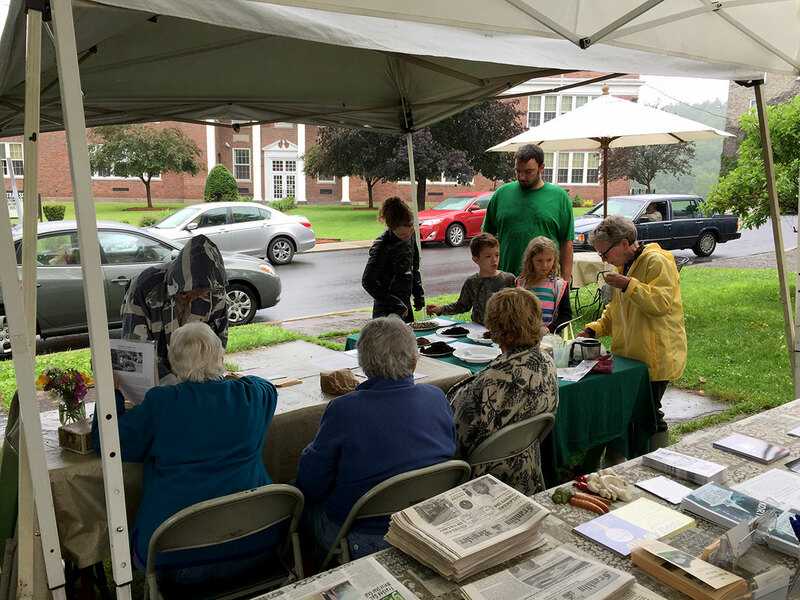 The Franklin Garden Club added a new feature to this year’s ticket table at the Franklin Farmers Market. 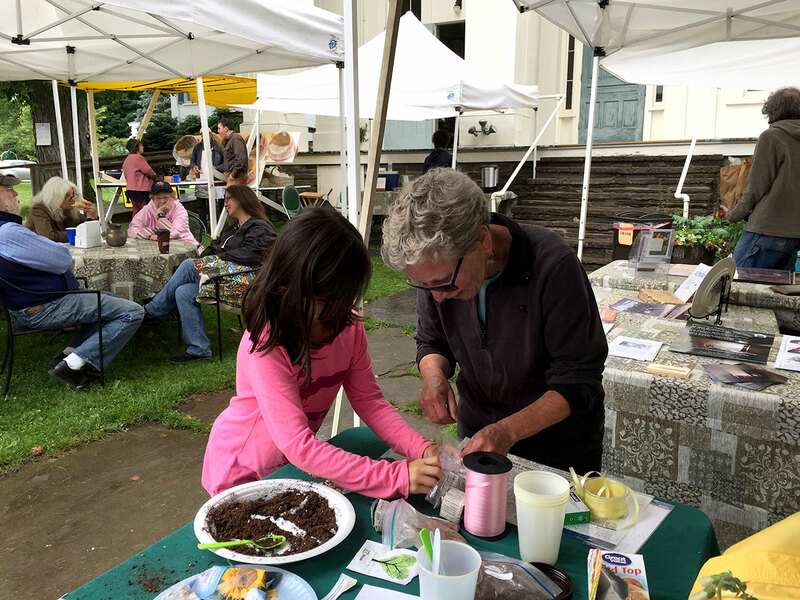 The Kid’s Corner offered young people the opportunity to get their hands dirty and learn about gardening with a display of different types of soil and mulch. 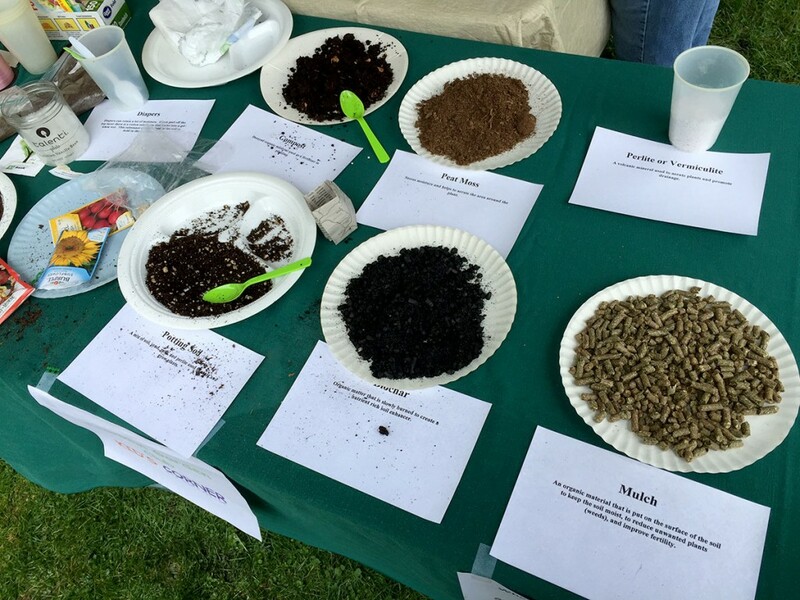 Local products such as Enviro Energy grass pellets and biochar were included in the display. 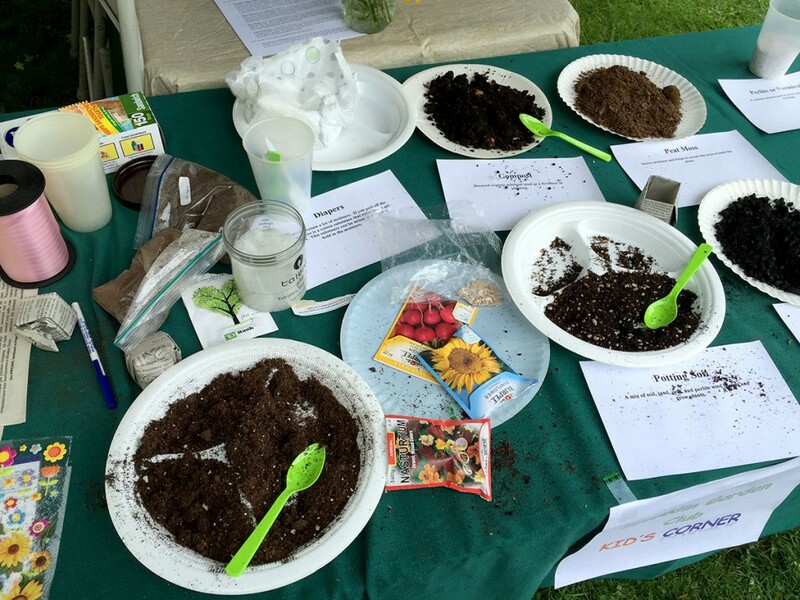 Each participant started their own garden by planting seeds in handmade newspaper biodegradable pots. Some of the kids also learned how to make the pots. 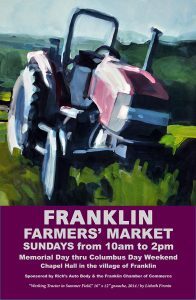 ASH CREEK FARM: Fresh herbs: basil, parsley, cilantro, lavender. Assorted geraniums. 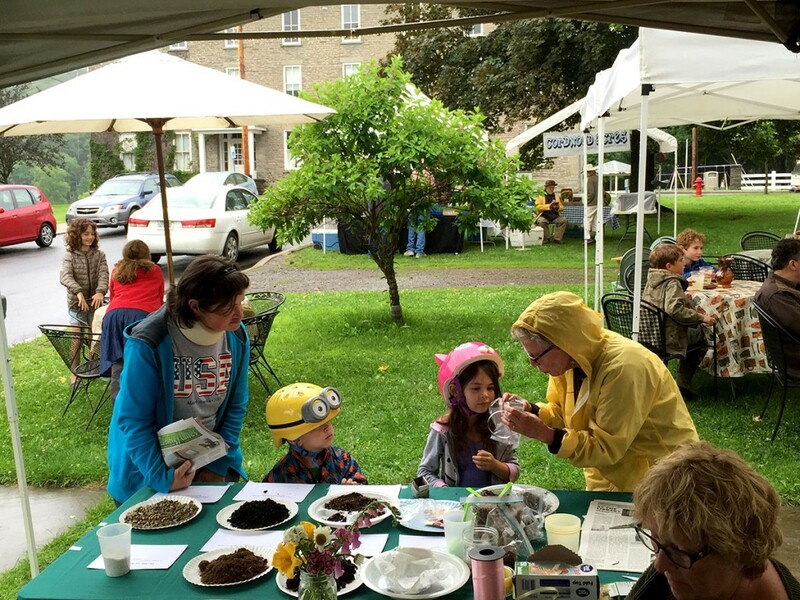 Vegetable and perennial plants for everyone to start their gardens. 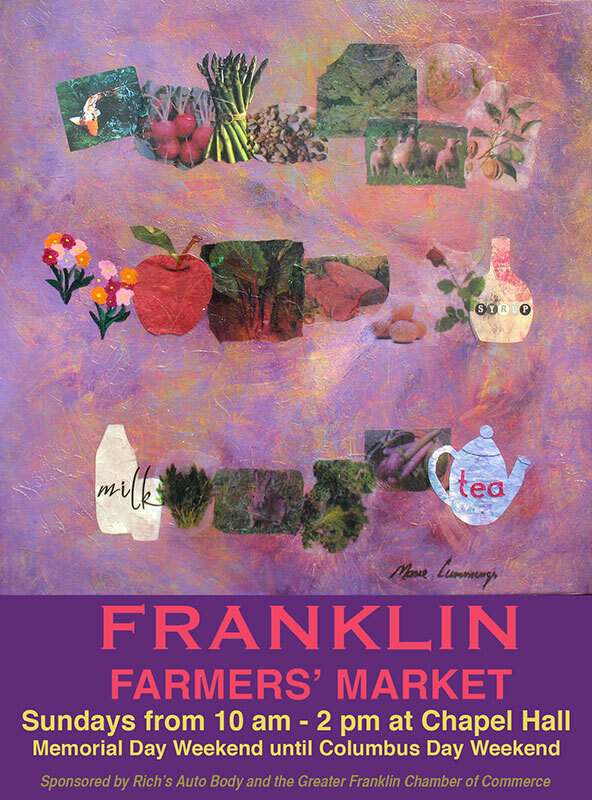 We will also be bringing dried herbs for cooking. CORDWOOD ACRES: Goat Milk Soap, Beeswax candles, Rhubarb, Dried Beans, Ground Beef, Brown eggs. Sorry kids ~ no baby bunnies til next week, just not big enough yet. ELK MEADOW FARM: Maple syrup & maple syrup products. Honey. 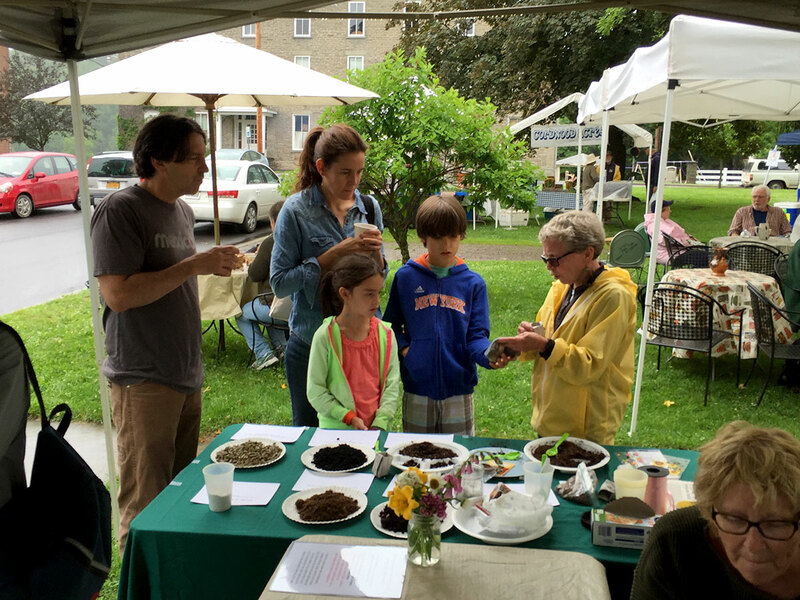 ENVIRO-ENERGY: Natural grass pellets for soil conditioner & mulch. Kiln-dried pine pellets for animal bedding and cat litter. Barley pellets to control algae growth in ponds. Shiitake mushrooms, small bags of biochar. 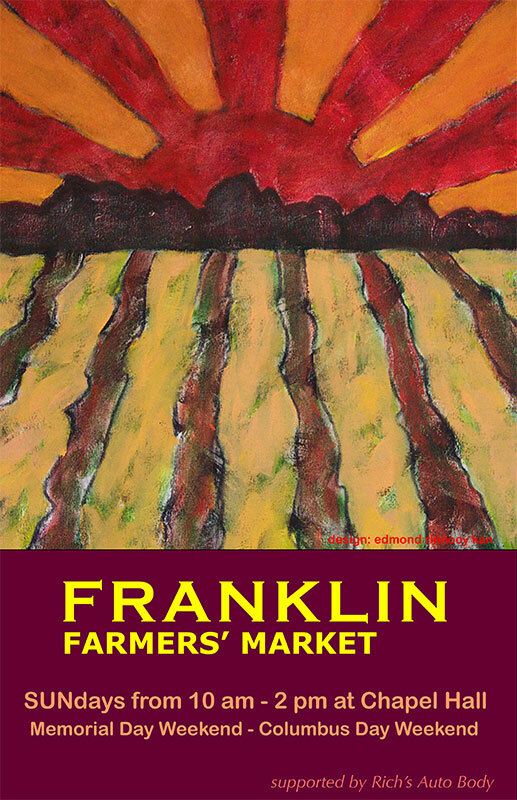 FOKISH: All organic breads, baguettes, flatbread, croissant, ciabatta, cinnamon buns, cardamom twists, rolls, bagels and more. 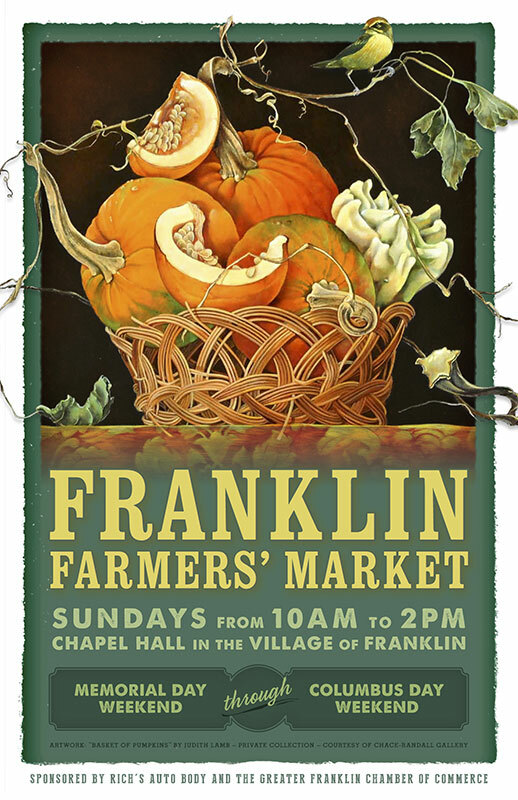 FRIENDS OF THE FRANKLIN FREE LIBRARY: Pies. GG WILLOW HANDMADE SOAPS and HANDMADE PRODUCTS: All made with pure healthy ingrediences. NO essence used for scents, pure 100% essential oils. Not made with Beef fat as it can go rancid. HARE AND FEATHER: Grass-fed organic beef hotdogs, whole & half chickens, duck, rabbit, sausage, eggs, jams & jellies, goat milk fudge, goat cheese. HOSPITALITY TENT: Fresh coffee, bottled water. 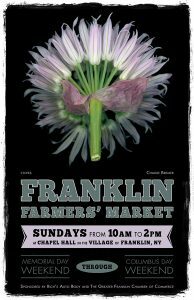 NATURALLY SPEAKING: Asparagus, Lettuce, Arugula, Green onion, Leeks, Shallots, Oregano, Chives, Cilantro, Potted lilies, Homemade Pies. 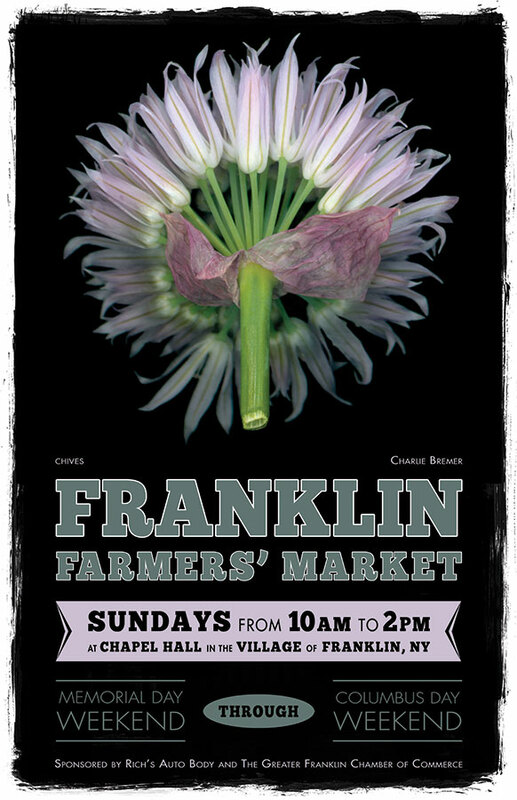 THORN COTTAGE FARM (formerly TWO-TON FARM): Spinach, burdock, dandelion, shallots, 2-hooks, market photos, and surprises! 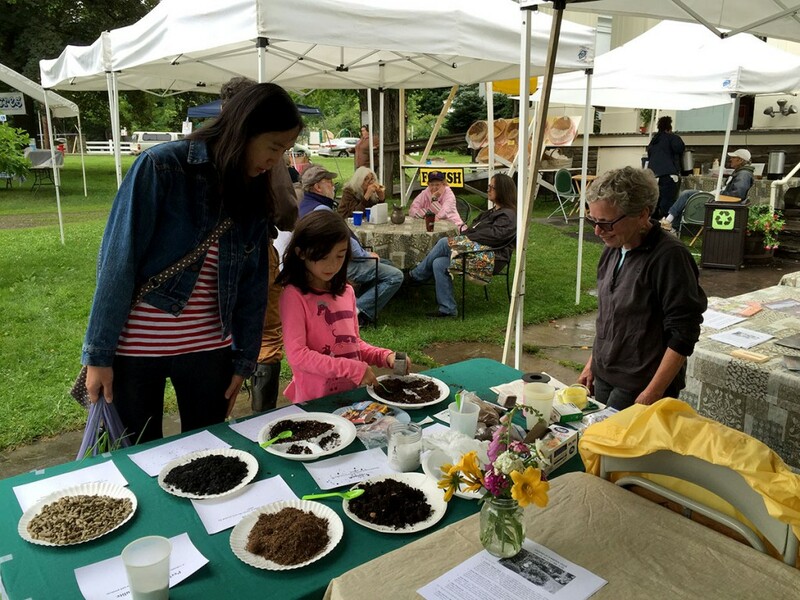 ASH CREEK HERBS: Potted herbs and ornamentals. 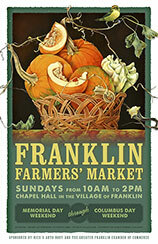 BREEZIE MAPLES FARM: Organic maple syrup & maple syrup products. 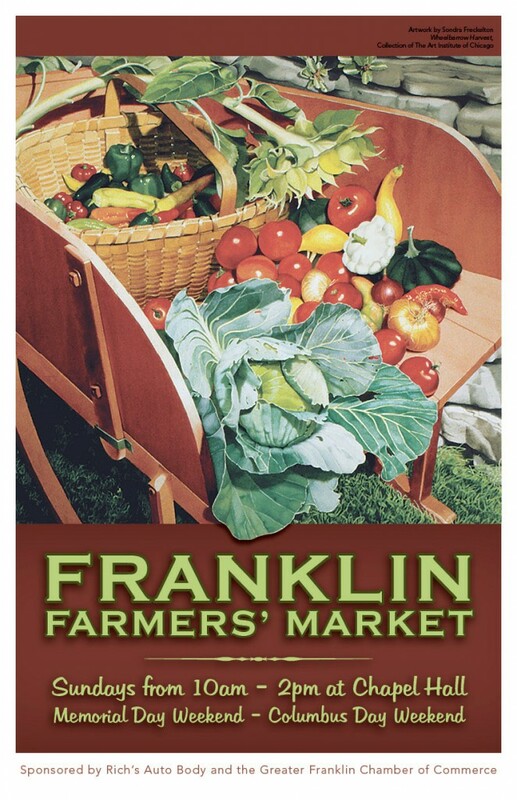 CORDWOOD ACRES: Goat milk soap & lotion, fresh herbs, garlic scapes, honey, hand dipped beeswax candles, soy wax pillar candles, mixed greens spring mix, beets, carrots, yellow & green french filet beans, yellow & green summer squash, arugula, blueberries, fresh cut flower arrangements, sunflowers. ENVIRO-ENERGY: Natural grass pellets for soil conditioner & mulch. Kiln-dried pine pellets for animal bedding and cat litter. Barley pellets to control algae growth in ponds. 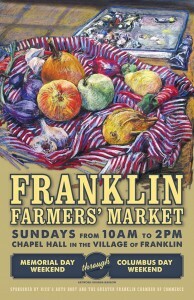 FOKISH: All Organic breads, baguettes, flatbread, croissant, ciabatta, cinnamon buns, cardamom twists, rolls, and more. HARE AND FEATHER: Duck, rabbit, chicken, eggs, jams, goat milk fudge, goat cheese. LE MARAIS CHOCOLATE: Crepes, brioche, French macarons, chocolate truffles, gluten-free pastries and more! 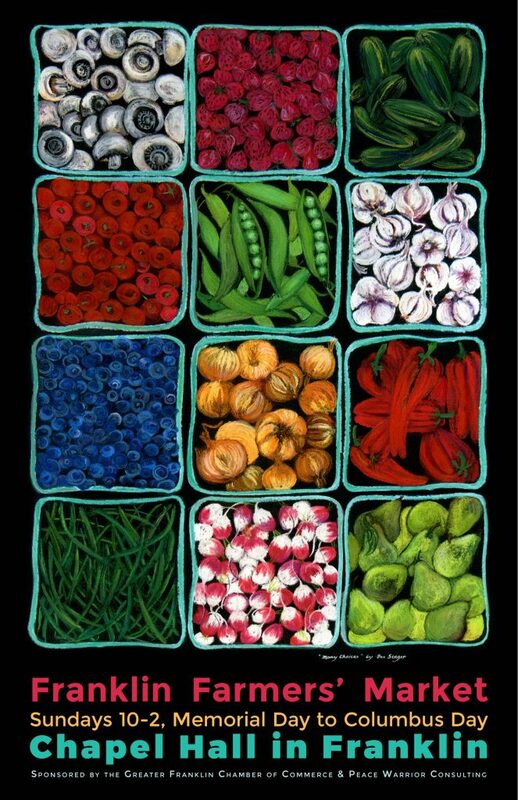 NATURALLY SPEAKING: Blueberries, cipollini onions, sugar snap peas, beets, turnips, garlic scapes, lettuce, dandelion greens, kale, swiss chard, green onions, parsley, cilantro, shallots, potted lilies. NECTAR HILL FARM: Grass-fed-on-organic-pastures Highland beef, lamb and mutton. Raw honey. Goat and cow cheeses. Fresh sprouts. Samples of a new line of sheepskin fashion and home accessories. THORN COTTAGE FARM (formerly TWO-TON FARM): Salad mix, fava beans, burdock, beets, basil, turnips, shallots, green garlic, scapes, cilantro, onions, hand forged hooks, and surprises. WHEAT HILL PHOTOGRAPHY: Nature and family photography by Maki Peake. 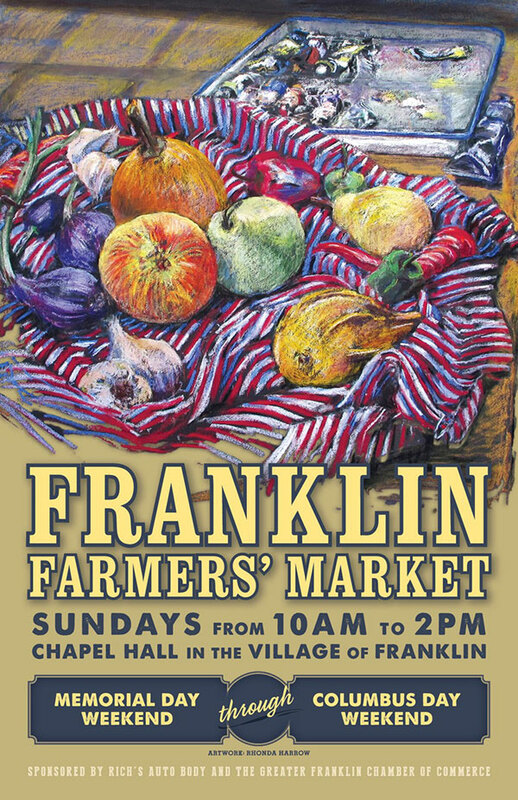 The Franklin Farmers’ Market at Chapel Hall starts its 8th season this Sunday, May 25th. This year’s poster is by Judith Lamb, and will be available for sale at the market. 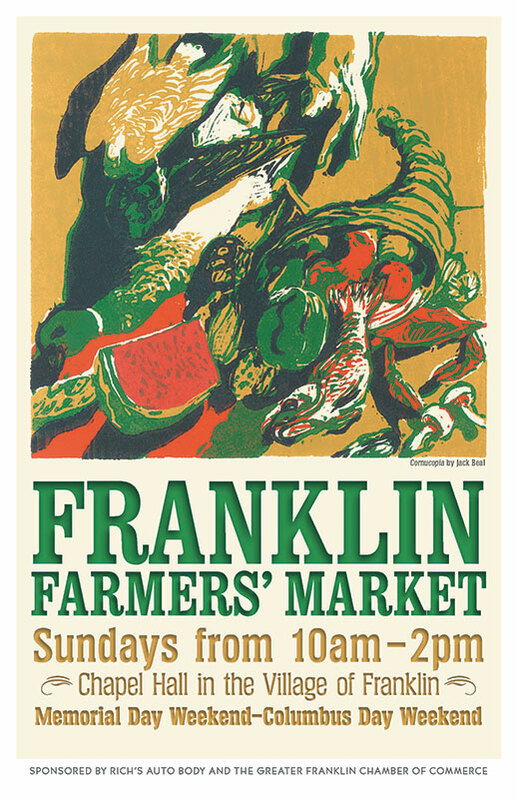 Each year the Franklin Farmers’ Market invites a local artist to create a poster. 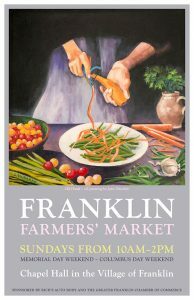 Contact us if you’d like to buy a poster. 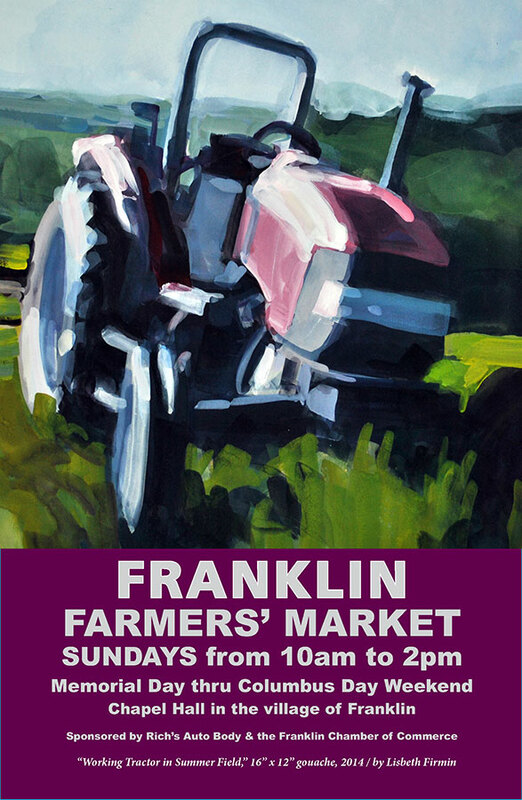 Purchase posters or 4″x 6″ postcards at the Farmers’ Market on Sundays, Memorial Day through Columbus day. 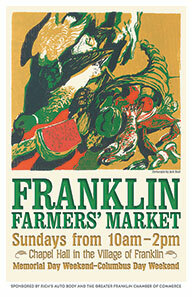 Ellen Curtis has asked me to pick the Franklin Market poster for this coming year. 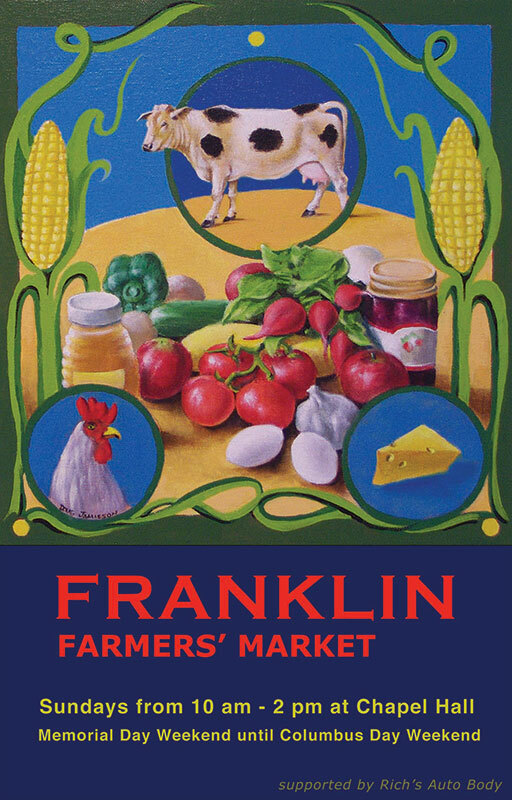 The poster has become a prestigious and sought after achievement, much to our small town’s surprise. We would like to include artists from the surrounding areas who want to participate. Ellen does not feel qualified to choose from such an array, and I promise not to judge by who is my best friend or even whom I think is the best artist. I’m going to look at who came up with the best and most fitting poster for the Franklin Farmers’ Market. Please send your image by February 15, 2014. Thank you friends and fellow artists.